Computer Troubleshooters congratulates Jeff Olson, owner of Computer Troubleshooters of Huntsville, on his achievement. INDEPENDENCE, Ohio—Aug. 24, 2018— Computer Troubleshooters recently hosted its 2018 Annual Computer Troubleshooters Conference in Las Vegas, NV. 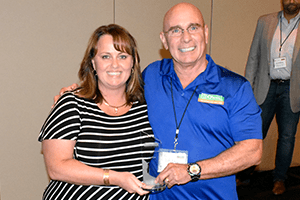 In addition to networking and strategizing, the Computer Troubleshooters network presented various awards to outstanding franchisees– most notably the 2018 Franchisee of the Year Award. This year’s recipient was Jeff Olson of Computer Troubleshooters in Huntsville, Alabama. Jeff Olson has been with the franchise for over 14 years, and has built an impressive managed services business through hard work, integrity and involvement in his local business community. Not only does he focus his energy on building his own business, but he also aims to grow the franchise and support his fellow franchisees. The entire Computer Troubleshooters franchise network congratulates Jeff on this well-deserved award and wishes him ongoing success with his business. To contact 2018 Franchisee of the Year, Jeff Olson, for help with technology services for your Huntsville business, please call 256-652-6643 or visit https://www.technology-solved.com/huntsville-al/. Computer Troubleshooters is the largest international network of franchise owners providing onsite computer services to small and medium-sized businesses and residential users. Computer Troubleshooters now has nearly 300 franchise locations worldwide in more than 8 countries. Computer Troubleshooters’ excellent franchising opportunities provide continual technical training and support; access to exclusive vendor relationships; access to office administration and billing systems; a local website with SEO services; plus active marketing campaigns that make it easy for customers to find the services of local franchises. The combination of these features makes Computer Troubleshooters the best choice for our clients and a great business opportunity for our franchisees.